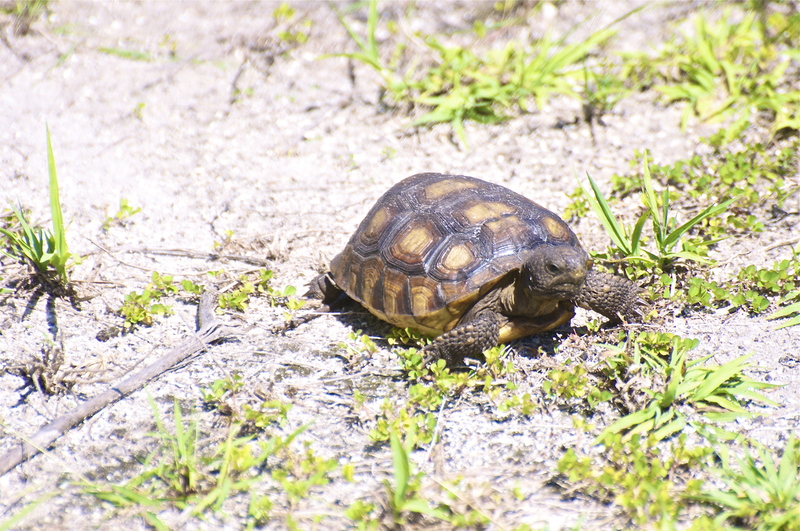 The Gopher tortoise gets its name from its ability to dig, and live in large, deep burrows. This ability to excavate is unusual in the world of tortoises. When I spotted my first wild Gopher tortoise, it proved that it has something else in common with its furry namesake. 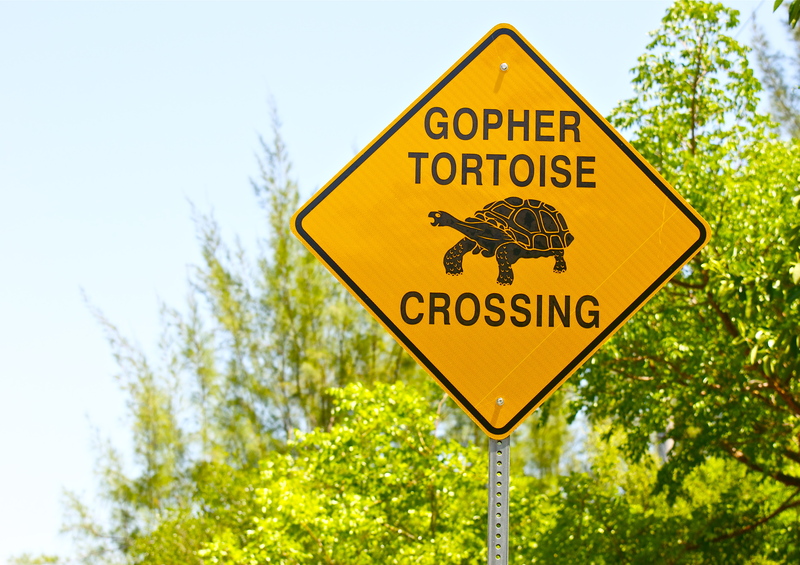 During a drive through Sanibel Island in Florida, it is likely that you’ll happen across the big, fluorescent yellow diamonds warning of tortoises crossing the road. Never having seen a wild tortoise, I was enthusiastically searching the road for small brown, slow moving speed humps. 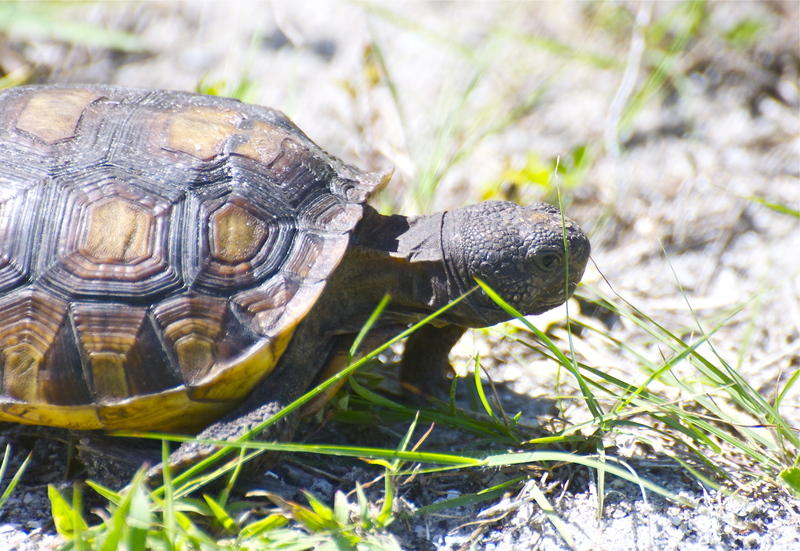 During an afternoon drive down the Sanibel main road, I spotted a man with a toddler following a large tortoise along the grass verge. This was surprising in itself but the real shock for me was the size of the tortoise. It was not up to Galapagos standards but was considerably bigger than those that I had seen in pet shops as a child. It wasn’t possible to stop the car without creating an incident, but now I knew where to look for them. The following day we did the drive again, I spotted another tortoise in a similar area and pulled in to a nearby car park. When the car was safely parked, I leaped out, camera in hand, and ran down the grassy verge. After all, it is a tortoise so it is definitely not going anywhere fast. I spotted the brown shape ahead and slowed while I adjusted the camera settings. At the same time, another car pulled over and a guy, probably in his mid-50s sprang out. I saw the tortoise stretch its wrinkled neck up and study us with its black beady eyes as we approached it from two different directions. Suddenly, to my shock, rather than pull the scrawny neck and head into the safety of its shell, the tortoise stood proud of the ground, turned and ran. I am far from fit, but I sincerely believed that I had the beating of a large tortoise. Realising with horror that this lumbering reptile with 2 inch legs was actually outpacing all me, I grappled for my camera to get a shot of it before it disappeared from view. I turned the focus ring, but the view finder was suddenly filled by action man from Indianapolis, who charged in to the long grass in hot pursuit. “Boy, did you see that thing go?” he boomed. “Those things are fast!” Sure enough, the tortoise had shown us a clean pair of heels and disappeared down a burrow. The experience taught me a few things. As I walked back to the car, feeling a little dejected, I spotted a second large tortoise grazing on the central reservation. This time I was alone and this tortoise was a little more tolerant of the strange man lying down, with a camera as traffic roared by. The Gopher tortoise is a resident of Florida, southern Georgia, South Carolina, Mississippi, Alabama and the parts of Louisiana. It is the only species of tortoise to be found in eastern USA. They grow up to 14.5 in. (37 cm) and can weigh up to 30 lb. (13.6 Kg) and live for close to 100 years. 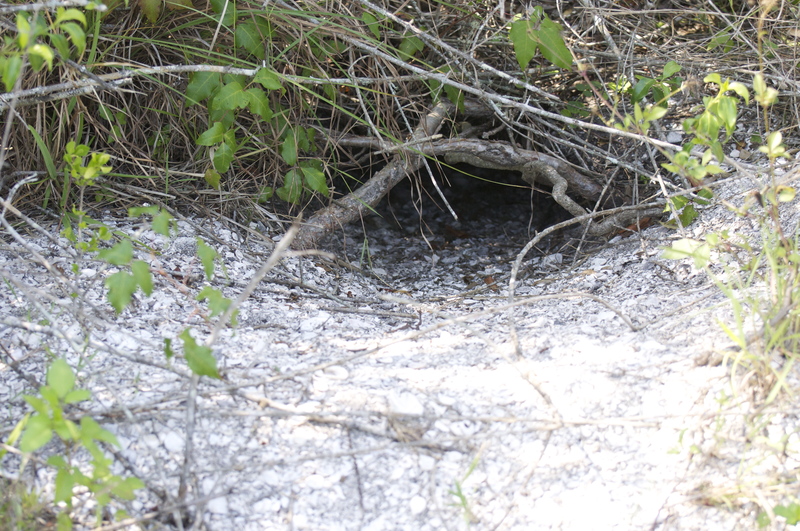 Florida state law protects the threatened Gopher tortoise and their burrows. This extends to mandating the safe removal and re-homing if development encroaches on tortoise habitats. Capture and release is strictly controlled by permit. 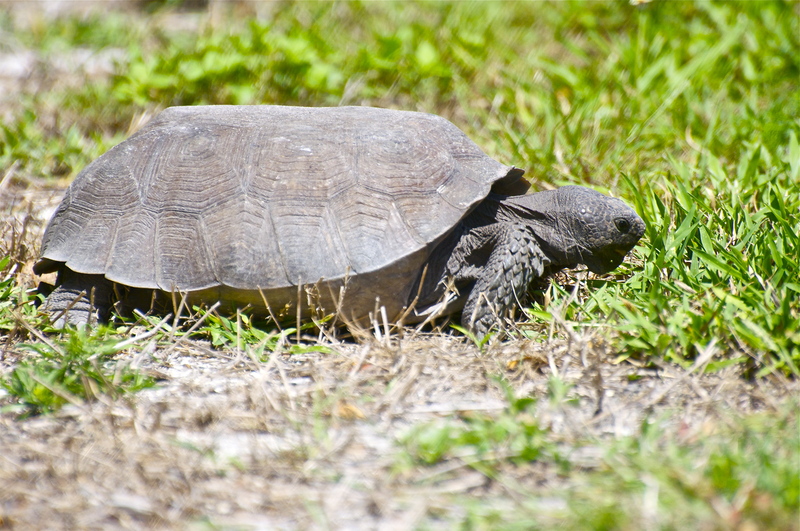 The Gopher tortoise is considered a keystone species due to their role in shaping the habitat for other species. There are around 350 different species that use active or abandoned tortoise burrows, including invertebrates, amphibians, reptiles, small mammals and even the burrowing owl. After a couple of days had passed, I returned to the site where I had been outrun by my first tortoise. I wanted to take a photograph of the burrow to add to this blog. My speedy friend was not on show, but I was amazed to find a baby Gopher tortoise, no bigger than my fist, nibbling young grass shoots nearby. It was very happy to be photographed, no doubt proud of the extra splash of colour that young ones display. 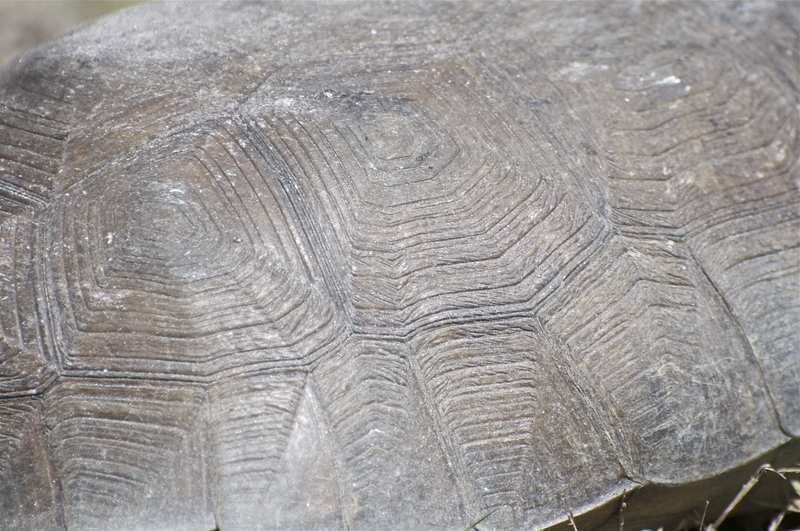 The carapace (upper shell) of the Gopher is covered by large, patterned scutes, or scales. In the adult tortoise these scutes are dull brown but in the young tortoise they are patterned with shades of brown and yellows. Each scute has rings, almost like a fingerprint, which although related to growth, are no guide to the tortoise’s age, as they better reflect food availability rather than time. As with so many threatened species, habitat preservation is critical, but tortoises can be helped by us in simple ways. If you see a tortoise happily feeding in the wild, leave it alone. It isn’t uncommon to see these creatures crossing the road in areas where they live. If so and if you can catch them, do help them cross safely but never alter their direction of travel or remove them to another environment. Leave their burrows alone, even if you see the not uncommon sight of a rattlesnake disappearing down the hole. It may be sharing the burrow, in harmony with a tortoise. Finally, avoid doing what one well-meaning but misguided tourist did. Confusing the tortoise for a turtle, the poor creature was “returned” to the Gulf of Mexico. Its shell serves as a permanent reminder of that sorry incident at the CROW wildlife clinic on Sanibel Island. Shares, comments or feedback welcomed, below.